Persian Students Organization, in partnership with Hancher Auditorium, is happy to bring Docunight to Iowa. Docunight, now part of Kiarostami Foundation, is a grass-roots initiative started more than four years ago in San Francisco to have monthly screenings of documentaries about Iran. Docunight has screening in more than 20 cities in North America, and now we are happy to bring these documentaries to Iowa. Please join us on the first Wednesday of every month at Iowa City Public Library - Meeting Room A to watch these documentaries. The life of Saideh Ghods changed completely when her two-year-old daughter Kiana was diagnosed with cancer. As she confronted her daughter’s suffering, she became aware of the suffering of so many impoverished families in hospital corridors around the country who were dealing with children afflicted by cancer. When, due to the doctors’ timely diagnosis, Kiana was on the path to a full recovery, Saideh Ghods resolved to prevent the unnecessary deaths of children with cancer caused by lack of access to therapeutic facilities or insufficient financial resources. 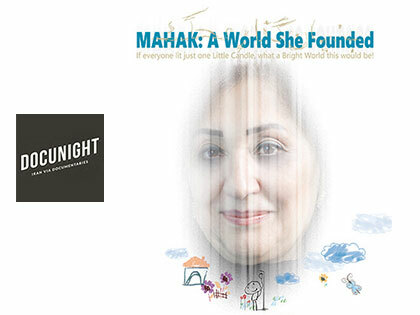 Ghods founded MAHAK over 25 years ago. It quickly gained fame and support throughout Iran. Today it is one of the most highly functioning and trusted charities in the country. Countless children have been helped and saved. A few years after founding MAHAK, Ghods, along with a group of Iranian philanthropists, established a fully equipped hospital in Tehran that specializes in treating children with cancer.